Thanks to Medea Benjamin, Code Pink, Reprieve, the Center for Constitutional Rights, and the attention and energy of 400 who gathered this past Saturday at Georgetown Law School, we were able to consider Drones Around the Globe: Proliferation & Resistance. It was a very worthwhile weekend which will impact how people act on and respond to U.S. use of drones. Five men were gathering behind a local mosque in their village of Khashamir in southeast Yemen when a US drone launched Hellfire missiles at them. Four of the men were instantly killed, their bodies blown into pieces. The fifth man was killed as he tried to crawl away. Two members of Al Qaeda were in Entesar al Qadhi’s village, one of the most oil rich areas of Yemen. Villagers were negotiating with the two men. A drone killed the chief negotiator, scuttling the negotiations and leaving the village vulnerable to Al Qaeda. 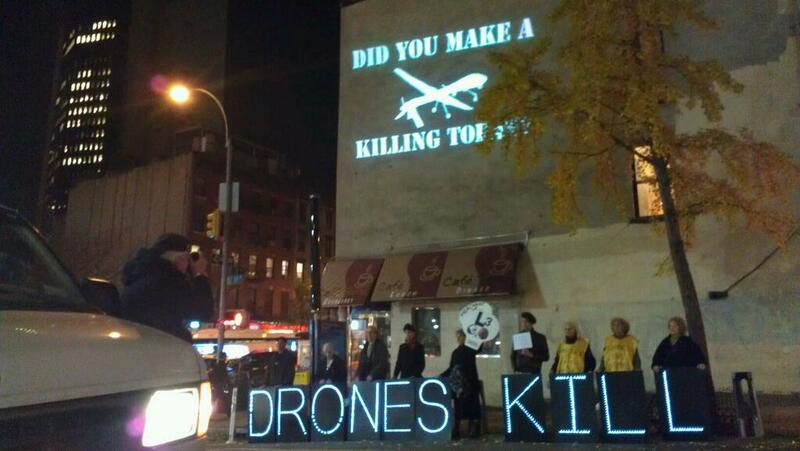 “The drones are for Al Qaeda, not against Al Qaeda,” al Qadhi said. Pardiss Kebriaei and Mary Ellen O’Connell joined Cohn in speaking about the legal challenge to drone strikes, exposing the Obama/Bush administration’s legal justification as very basically counter to the Geneva Convention and the UN Charter (which themselves are effectively U.S. law). Very interesting to me was a presentation by Dalit Baum (@dalitbaum) on the use of autonomous weapons by Israel. Baum described unmanned bulldozers knocking down homes. Why? The Israeli military needed to remove human operators because 1) they might talk afterward, and 2) they might lose their nerve. Baum also showed a chilling video clip of a drone killing of several Bedouin youth near the Wall in Gaza by Israeli drones. We learned that the major drone producing countries are the U.S., the U.K., and Israel, with Israel producing 41% of the world’s drones. This entry was posted on November 19, 2013, 8:31 am and is filed under covert drone war. You can follow any responses to this entry through RSS 2.0. You can leave a response, or trackback from your own site.